In his Near Year speech, Chairman Choi Jeong-woo of POSCO said the steelmaker will divide its operation into three major sectors: business, society and people. Steel production falls in the business sector. The sale of the premium steel products such as WF-WB will be pushed as a way to cope with reduced demand and lower steel prices. He said marketing strategies should “return to the basics” with the production sectors cooperating to supply the steel products that customers want at the right time. “We also have to strengthen the R&D activities by focusing on the development of new steel products with an open and market-oriented activities so that new steel products that can lead the future steel market can be put on the market,” he said. POSCO’s overseas operations, considered weak in international finance and changes in operational environments, should find a way to boost growth with preemptive moves in such key areas as cooperation in trade, reductions in operational capital and reduced risks. As for non-steel sectors, they should complete a refurbishment in the first half, and each sector should draw up its reform strategy and new business model in order to nurture the special business sector so that the sectors further contribute to the company’s profits. 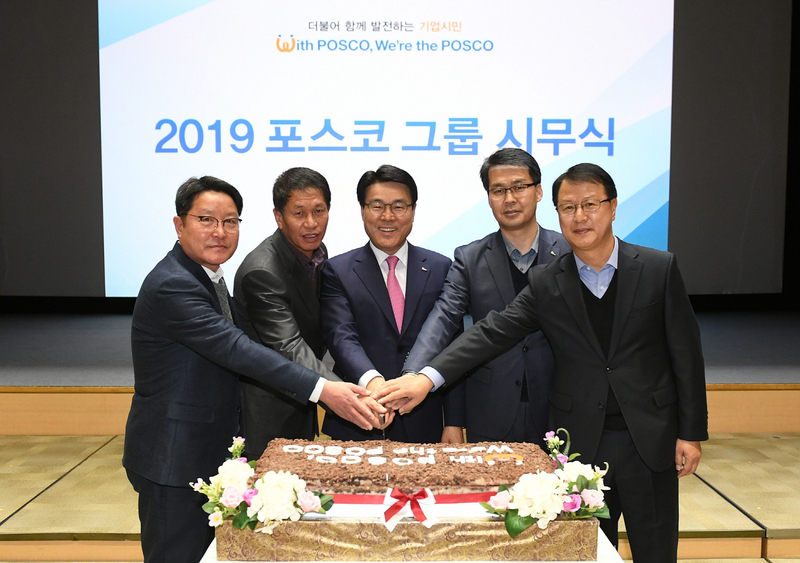 Chairman Choi of POSCO counts on the steelmaker’s two operational sectors, the steel production and the fuel battery sector, for POSCO to maintain its standard level of profitability, despite the gloomy environment for the steel industry this year. He will try to upgrade the company’s steel production facilities to produce higher grade steel products while focusing on the fuel battery sector to carry the load for the entire steel maker by turning out the highly efficient electric car batteries to back up his plan to invest 45 trillion won in the next five years until 2023 and hire 20,000 new employees. For the steel sector, the 3rd blast furnace located at the Gwangyang Steel Complex will be turned into a smart furnace equipped with the production facilities for giga steel products and the addition of the gas power plant using the gas generated from the steel production processes at the cost of 26 trillion won. POSCO will boost its production of steel plates for the auto industry to 1,200 tons per year by 2025, up from 9.1 million tons this year, to firm up its position as the top global steel maker. POSCO plans to take over 20 percent 2nd battery market in the world by 2030 with the sale of 17 trillion won in the year based on its long-term plan for the 2nd battery business. According to the classification defined by the World Steel Association, steel with a strength yield in excess of 550 Mega Pascal is generally referred to as Advanced High-Strength Steel. Steel such as this is sometimes called "Ultra High Strength Steel" for its tensile strength exceeding 780 MPa. AHSS with tensile strength of at least 1,000 MPa is often called "GigaPascal Steel." POSCO is the only steelmaker in the world that mass produces the TWIP steel, a Giga Steel that can withstand 100 kilograms or more weight per square millimeter. A POSCO official said POSCO TWIP steel products can be used in various vehicle parts, including front and rear bumper beams, to absorb exterior shocks.